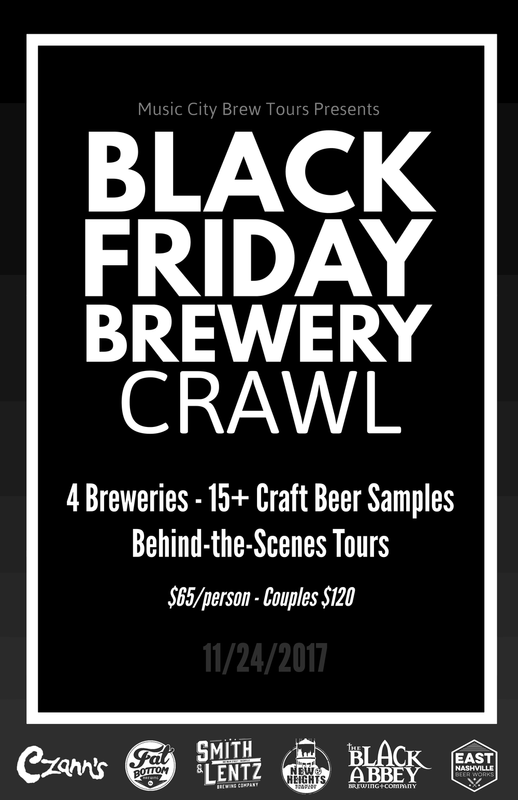 Black Friday Brewery Crawl 2017! Visit 4 Nashville craft breweries, enjoy 15+ beer samples & behind-the-scenes tours. All transportation provided. Why send the day fighting the crowds at Walmart & Best Buy when you could be drinking beer instead? We'll take you to 4 of Nashville's best breweries with plenty of samples along the way. You'll spend time behind-the-scenes with the Brewmasters learning about their craft and the passion they put into each pint. The tour is approximately 4.5 hours long and we do all the driving so you can relax and enjoy the best cure for a turkey hangover.